Indoor and out, Riviera at East Windsor provides many ways for residents to stay in shape. Once the site of American Revolutionary War battles, Mercer County, NJ real estate now draws in homebuyers of all ages, students, new businesses, and active adults. There are 19 active adult communities spread out throughout the county, with different price points and community sizes. Although the majority have clubhouses with fitness centers, some of these have that extra special something that makes them truly stand out. What better way is there to start your day than with a good workout? Having a first-rate exercise facility in your own backyard makes such a big difference. Convenience is important; less time spent driving there means it's less of a chore. Working out with friends can also be very motivating. Some of the best centers also have aerobics studios, pools, and fitness classes. Mercer County also offers abundant outdoor recreation to get your heart rate up, with 10,000 acres of open space, recreation facilities, and parks. Washington Crossing State Park in Hopewell Township has trails, fishing, and cross-country skiing and snowshoeing. Princeton Battlefield State Park, also historically significant, has trails and cross-country skiing as well. If you are interested in Mercer County, NJ real estate and 55+ communities with superb fitness centers, check out these communities. Elements at West Windsor is a smaller active adult community that has 156 single-family, resale homes. At its heart is the 10,000 square-foot clubhouse. Here, homeowners can exercise in the fitness center or participate in the Fit n’ Firm class in the aerobics & dance studio. Swimmers enjoy doing laps in the clean indoor pool, and they can also use the outdoor pool during the warmer seasons. Bocce ball courts, tennis courts, and walking trails are additional highlights of this woodsy property, which has 115 acres of open space. The generously sized, upscale homes come in four models ranging from 1,942 to 3,068 square feet. They come with one to three bedrooms, one-and-a-half to three bathrooms, expansive master suites, and attached two-car garages. Some also feature extra dens and patios. As the largest 55+ community in this list, Village Grande at Bear Creek comes in at 540 single-family, resale homes. This D.R. Horton community is gated and has a 15,000 square-foot clubhouse that is enhanced by quality landscaping. The fitness center sponsors classes like yoga and Tai Chi, plus water aerobics in the indoor pool. There is also a sauna and several activity rooms in the clubhouse. Outdoor amenities include a second pool, walking & biking trails, tennis, horseshoes, and a putting green. The six models are sized from 1,372 to 2,261 square feet with two bedrooms, two to two-and-a-half bathrooms. and one or two-car garages. Desirable features like oversized kitchens, front porches, first-floor master suites, and dens are included. Evergreen at Hamilton is an affordable 55+ community with 416 attached and single-family, resale homes. Its clubhouse has a vibrant exercise room and an indoor pool. Two of the most popular group classes are water aerobics and strength training. For outdoor exercise, you can try out the putting green, or play tennis or bocce ball. The clubhouse also features a ballroom and catering kitchen, an arts studio, a library, and a computer room. The attached homes range from 1,300 to 3,000 square feet with two to three bedrooms, two bathrooms, and attached garages. The single-family homes are about the same size and have two to three bedrooms, two bathrooms, and attached garages. Riviera at East Windsor is an appealing gated community that has 375 single family homes in East Windsor, about half an hour outside of Trenton. The 12,000 square-foot clubhouse has a high-quality fitness center with its own indoor pool, locker rooms, and steam rooms. In addition to dance classes, other community clubs and special events take place here. Some of these include bowling, cards, art lessons, dance classes, and brunches. 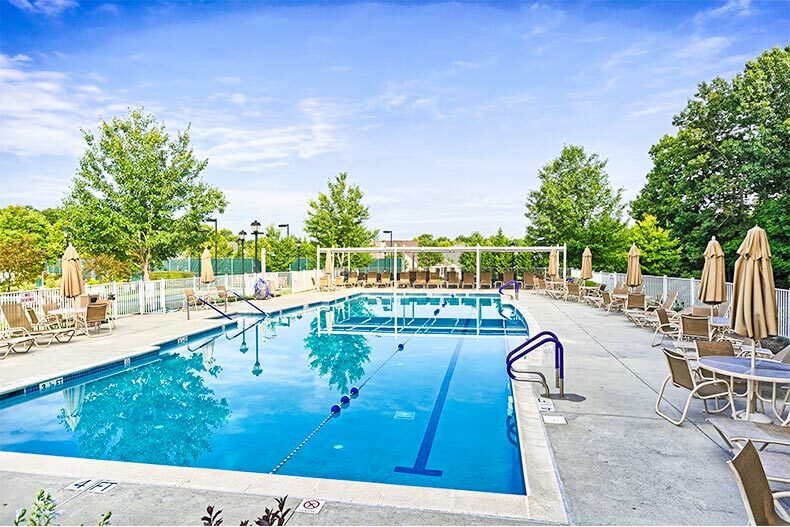 Outdoor amenities include a pool and patio, walking trails, and sports courts. There are eight impressive floor plans sized from 1,684 to 2,572 square feet with two to three bedrooms, two to three bathrooms, master suites, walk-in closets, and attached two-car garages. Some feature dens, lofts, sitting areas, and breakfast bars. Located in the southern portion of Mercer County, Robbinsville is home to Raajipo, a new, gated community that will have 115 new luxury homes when completed. Plans are underway for a 4,000 square-foot, modern clubhouse. It will have an indoor spa and fitness center, along with an outdoor pool and patio, tennis courts, a basketball court, and walking trails. Residents can also use the business center, and enjoy gatherings in the clubhouse’s multi-purpose room and great hall. There are four floor plans ranging from 2,186 to 2,826 square feet with two or three bedrooms, two bathrooms, and attached two-car garages. These homes all feature first-floor master suites with luxurious bathrooms. Upgrades include lofts, patios, and dens.